"Sampath Speaking" - the thoughts of an Insurer from Thiruvallikkeni: High Court directs probe into missing idols ~ how sad !! High Court directs probe into missing idols ~ how sad !! We go to temples ~ there is a popular notion in Tamil Nadu that brahminical caste controls temple …. . .. .. one needs to understand that there are Priests and rituals, there are various functions including preparation of food for the Lord and purappadu (procession) of idols .. .. .. the administration of the Temple (managing the funds received and administering the various functional activities) lies with the Govt. – done through Hindu Religious & Charitable Endowments (HR&CE) – that way you have the State Govt celebrating the birth of ex-CM in Temples, though this activity would have absolutely no connection with the Temple, Lord, its devotees and more so, in respect of the donations offered in Hundis and other ways – as these are specific towards the temple and not for anything else. Worshipping the Supreme God in idol form – the ‘Archavatharam’ is considered most sacred for Hindus and there are thousands of puranic temples in Tamilnadu. Temples are not merely places of worship, they have protected the literature, developed moral rectitude, awakened spirituality, functioned as places of music, art, sculpture, architecture, culture, and many a times as storage of food grains, a la granary. Kings and Emperors who ruled this part of the land, glorified themselves by constructing big temples and serving the God in many ways. The Kings, patrons and later day rich barons, donated vast tracts of land and property to the Temple to ensure that they flourish, thereby the devotees also flourish. They arranged for ‘annadanam’ – free distribution of food to devotees. Around 100 years ago, there was the system of Trustees, comprising primarily of those locals with good education, religious fervour and moral correctness – there were some instances where men at the helm indulged in some wrongful acts, - the need for a strong corrective measures was felt. Then came the Govt. control. Now, in Tamilnadu, the temples are administered by Hindu Religious and Charitable Endowments Administration Department [HR&CE]. Primarily, they are not owners but managers of the properties of the Temples and theoretically should be taking care of the property without altering or interfering with the religious affairs, agamas and holy practices. By their own admission HR&CE considers the maintenance of temples as its first and foremost duty keeping the greatness of temples in mind and carries out its functions accordingly. There is no similar set-up organization nor Govt control over the places of worship of any other religion - Hindu Religious and Charitable Endowments Administration Department supervises the administration of Hindu and Jain Religious Institutions and Hindu Charitable Endowments in Tamilnadu. It has 36356 temples; 56 Mutts and 17 Jain temples under its control. The Madras Hindu Religious and Charitable Endowments Act, 1951, came into force from 28th August 1951. There have been amendments to the Act from time to time.Recently a newsitem in Dinamalar stated when a list was so drawn, it was observed that many temples have gone missing !! Of the many functions and responsibilities of the HR&CE Dept is the fixation of fair rent for the sites and buildings belonging to the religious institutions. It is stated that these are to be revised periodically, atleast once in three years by a committee constituted by the Commissioner. The fair rent is fixed in accordance with the market value of the land and cost of the building worked out as per Government Order. There is another, more important responsibility, that of ‘Temple Renovation’ which mostly occur with the support of many philanthropists and religiously minded people. Now read this sad story of ‘missing idols’ (not due to the theft !) and missing ornaments – where the custodians are being accused : HC orders probe into missing idols at Srirangam temple ~ Times of India Chennai edition of date 7th Dec 2018. The Madras high court has directed the idol wing CID to conduct a preliminary probe into the alleged theft of 42 ancient temple idols and artefacts from Srirangam Temple during its renovation, and file a report to the court in a week. A special bench of Justice R Mahadevan and Justice P D Audikesavalu issued the interim direction on the pleas moved by Rangarajan Narasimhan and advocate Elephant G Rajendran seeking direction to the wing to register an FIR based on their complaints on the missing idols. 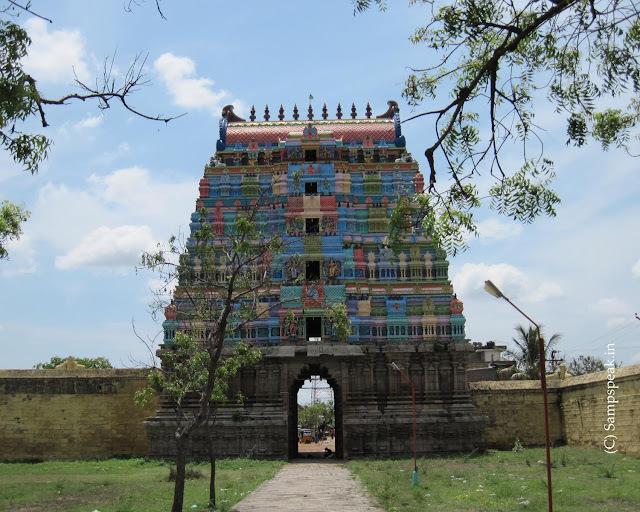 When the plea came up for hearing, Rajendran submitted that 52 antique doors of the temple and many ancient stones and other artefacts were removed/replaced from the temple during its renovation. “There are two types of thieves who steal temple properties. One steals idols and the other steals temple jewellery. The latter is mostly officials of Hindu Religious and Charitable Endowments department,” Rajendran said. In one particular case, an official of the department stole a jewellery from a temple and tried to sell it off in Bangalore. Fortunately, the jeweller whom the official approached was the one who donated the jewel to the temple. Later, based on a complaint from the jeweller the official was arrested,” he added. To this, counsel representing the department submitted that since a similar complaint was already filed by Narasimhan and the wing had already commenced the probe there could not be yet another FIR for the same issue.Recording the submissions, the bench tagged the pleas and directed the wing to conduct a preliminary probe to ascertain whether prima facie case was made out and file a report to the court within one week. Similarly, in the plea alleging theft of an antique peacock idol from Kapaleeshwarar Temple, Mylapore, the department informed the court that a high-level team comprising joint commissioners of Rameshwaram and Madurai had been constituted to probe the allegation. The department also sought the court to direct the idol wing to not to interfere in its actions. Recording the same, the bench said the department could proceed further with the inquiry. The court, however, made it clear that the idol wing could also proceed with its probe notwithstanding the inquiry being conducted by the department. PS : the latter half of this post .. .. reproduced from Times of India, Chennai edition.